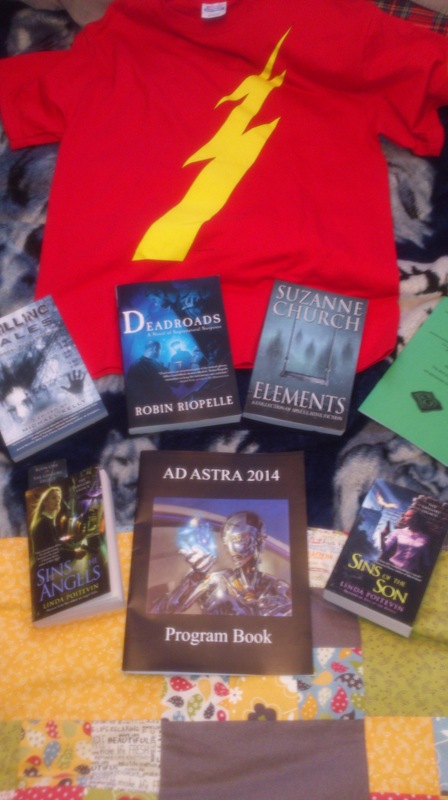 2014 was the first time I’ve attended Ad Astra, Toronto’s premiere science fiction and fantasy fan convention. All in all, it was a great weekend. 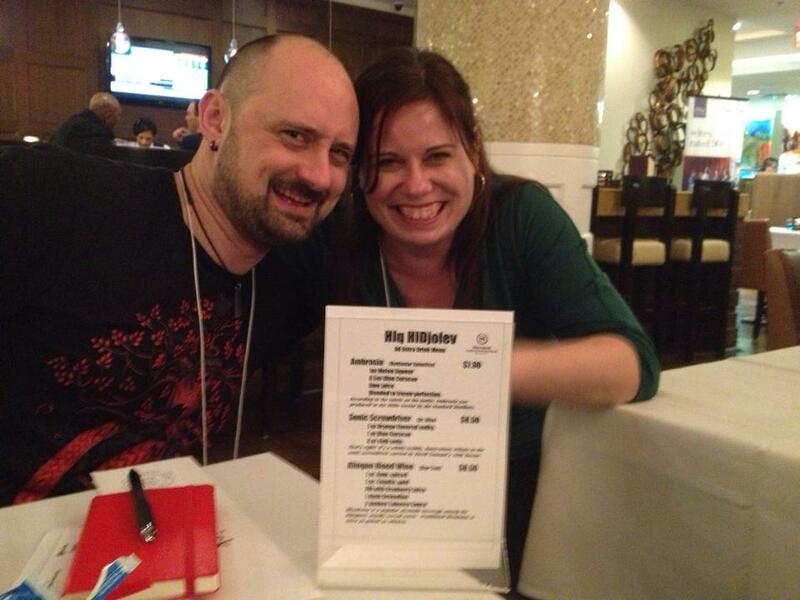 Guests included: authors Patricia Briggs and Steven Erikson, as well as editor Anne Groell. My only regret is that I wasn’t feeling well. I rarely get sick, rarely get con crud, but I rolled in sick this time, and had to make the best of it. If any of you Toronto folks caught my cold, my apologies. I took it easy on the Friday, my throat was sore and I was already running a sleep debt from various deadlines leading up Ad Astra. Definitely not the best way to get started, I know. On the plus side, Ad Astra was held in the same hotel that hosted the World Fantasy Convention in 2012, so I at least I already knew the venue. Granted, the hotel is technically in Markham, so it’s hell and gone away from the airport (and I hate traveling on public transit with luggage) but it is a nice venue. My immediate thought about the con was how quickly it felt like a “home convention.” Keycon feels this way, obviously. So does When Words Collide in Calgary. As I went to grab dinner in the restaurant, Robert J. Sawyer was sitting with Steven Erikson, and introduced me. Steve used to live in Winnipeg, though that time predated my writing career. Also in the restaurant were a gang of rogues that I’ve met in my previous travels, including Matt Moore, Derek Künsken, and Michael Matheson. One of my favourite things about conventions is when I finally get to meet people that I’ve been interacting with on Twitter or Facebook. This time I met writer and podcaster, Adam Shaftoe and Blue Magic author, Alyx Dellamonica (who I interviewed ages ago). 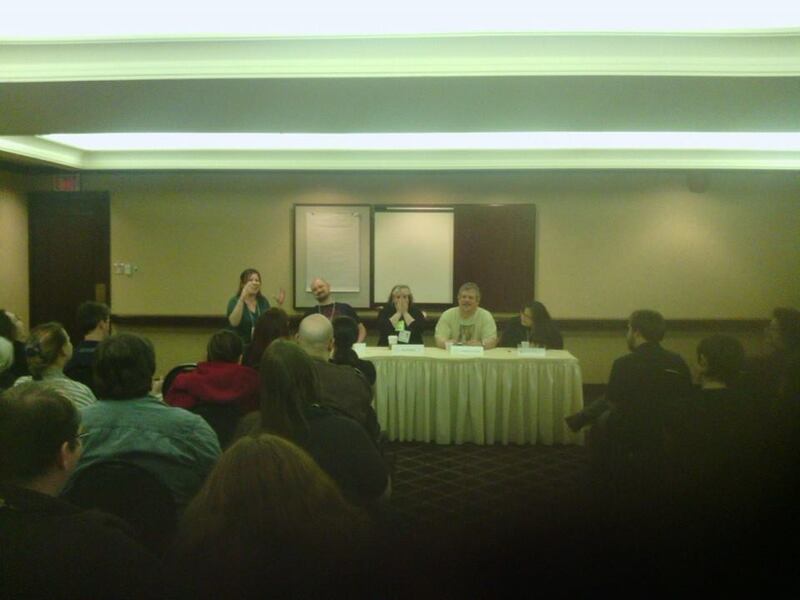 After having my gear stowed and registration picked up, I had my first panel of the convention. Normally, I like to attend a con at least once before I do any programming, but that’s not always going to be an option, and as I’d asked excellent indie bookseller, Bakka Phoenix to bring stock of my books to the con (Thanks, Team Bakka! ), it seemed a good idea to get out there and be seen. Panels are fun, but it’s a fun that’s also wholly dependent on who you share them with and what kind of crowd you draw. There’s lots of advice I’ve heard about doing panels well which is easily said, but harder to implement. I try to be fun, have fun, as well as be informative. And I do my best to not bring up my books. I hate sharing panels with the “Mybookmybookmybook” author. If you’ve ever been to a convention, you probably know the one, they have nothing to say unless it directly relates to something they’ve written or they try to twist everything back around to their writing. I bowed out of the parties quite early Friday night, I even had to skip the Romulan Ale, Blue Milk, and Slurm (it’s highly addictive!) replicas that the restaurant was offering (among other SF&F drinks) during Klingon Kareoke. Evidently, Klingons really like Alannah Myles. Who knew? Me and Marie Bilodeau. Photo by Derek Newman-Stille. Lots of good fun on Saturday. 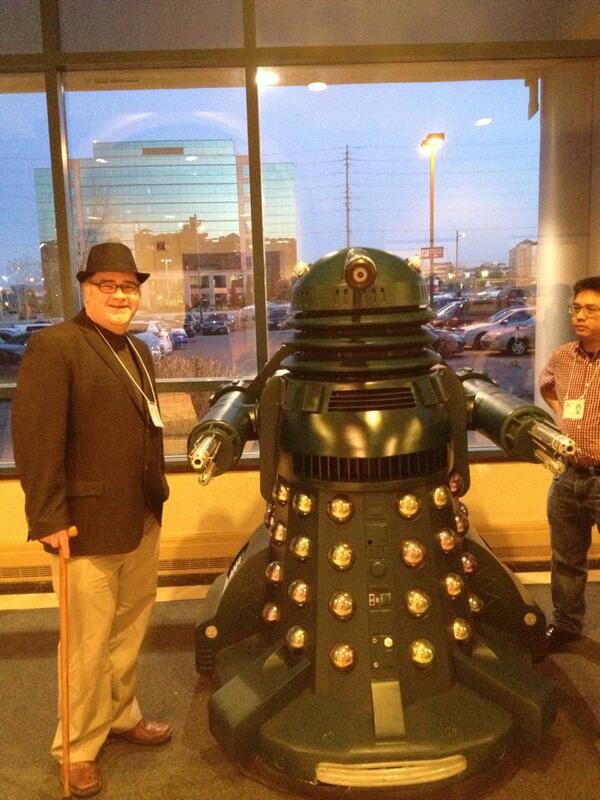 I enjoyed meals with friends before getting to the mass author signing. Not a lot of signatures to be had, that’s the nature of the game though, It’s hard to begrudge Patricia Briggs and Steven Erikson their fans because they’re awesome folks (and at least no one actually pointed out that the GoHs had a longer signing line than me. Yes, that’s happened). I sat close to Suzanne Church and Julie E. Czerneda so I had some fun folks to talk to. Julie was even gracious enough to give me an opinion of the titles I’m considering for Thunder Road book 3. Thanks, Julie! 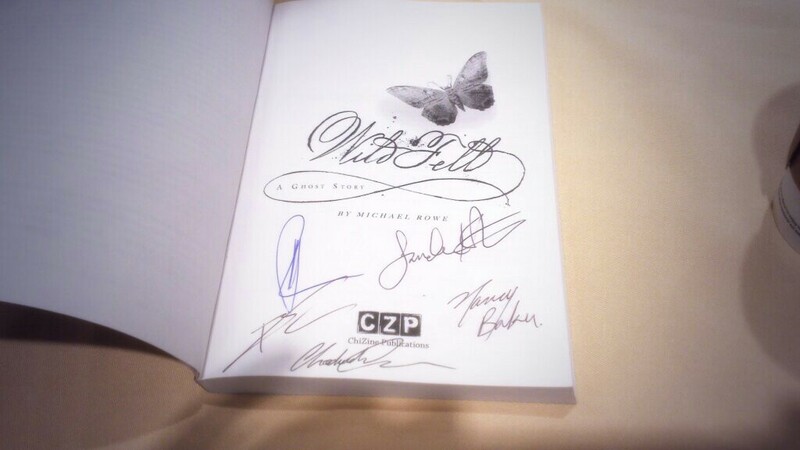 One cool thing I got to do was sign a copy of Michael Rowe’s stellar book, Wild Fell, for collector Mike Cramer. Mike likes to have signatures from everyone involved in the book, and Michael was kind enough to thank me in the acknowledgements of Wild Fell (You’re very welcome, Michael!). After the signings, Derek Newman-Stille caught up to me and we did a sit down interview for Speculating Canada that will air on Trent Radio. I’ll post a link or announcement about the date as soon as I have one. Derek Newman-Stille, photo by yours truly. My final bit of programming (I went light this year, and good thing I did, as my voice always felt just this side of collapse) was the panel “Comics as Literature”, ably moderated by James Bambury. We were joined by Michael J. Martineck and Sarah WaterRaven. I think that one went very well too. Good questions from Derek Newman-Stille as always, and from new con pal, Angela Keely. After supper at Host, a local Indian restaurant, (their butter chicken was good, but I always feel I’m cheating on hometown fav, East India Company, but EIC is still winner and champeen of the curry universe as far as I’ve experienced) we headed up to the party rooms and books launches. In one room Bundoran Press was launching Strange Bedfellows, edited by Hayden Trenholm (I contributed to the Indiegogo to support this one), and Alison Sinclair’s Breakpoint: Nereis. Robin Riopelle joined them, launching her debut from Nightshade Books, Dead Roads (and I’m so happy her books made it! She was having customs and FedEx issues and at least her launch had a happier ending than my Canada Post-foiled Edmonton launch of Tombstone Blues). In the other party room, Suzanne Church and Michael J. Martineck were launching their books from EDGE Publications: Elements: A Collection of Speculative Fiction and Milkman: A Freeworld Novel. Michael Matheson had a reading scheduled for 10:30pm, and since Fun Things would be happening opposite the slot and there was nothing happening after, his reading morphed into a boozy sharing of Pacific Rim/Star Wars fan fic. Good Times. Probably the highlight of the con, in fact. Angela Keely brought down the house with her reading of the first four chapters of legendary (and legendarily bad) Harry Potter fan fic, My Immortal. There is talk of this becoming a thing for next year’s Ad Astra. I hope it does. From the readings we meandered our way back upstairs. After roughly 4:00 in the morning, I realized my words were no longer working and went to bed. I did manage a bit of sleep and thank Thor for late checkouts. 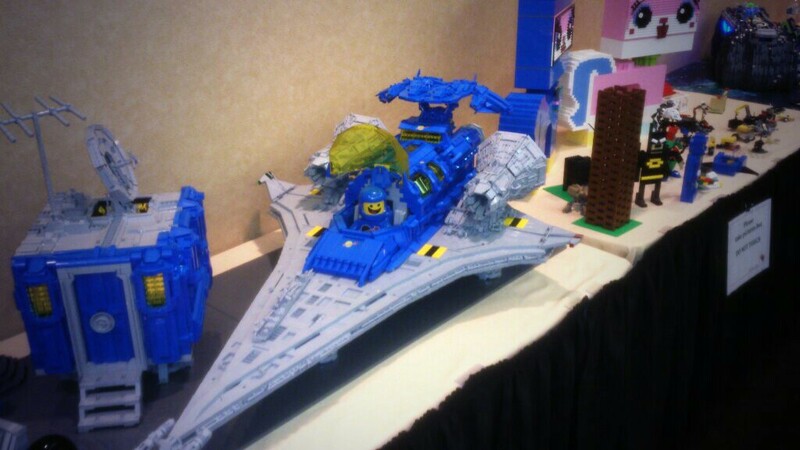 Check out the LEGO room! 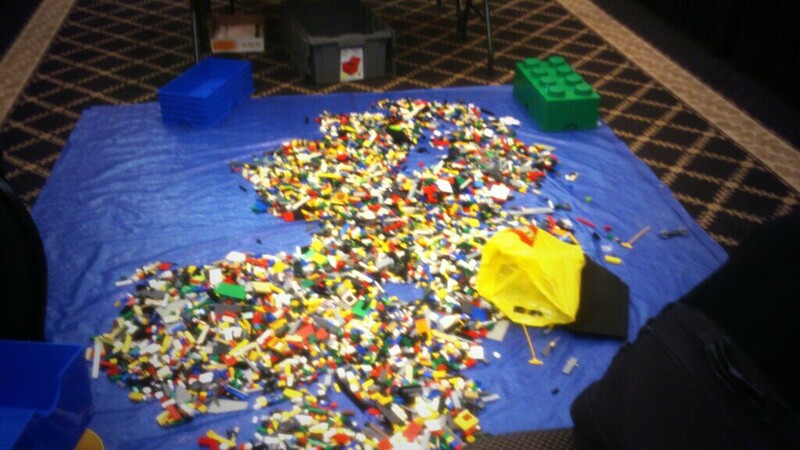 Seeing this loose tumble of multicoloured bricks really is a thing of beauty. 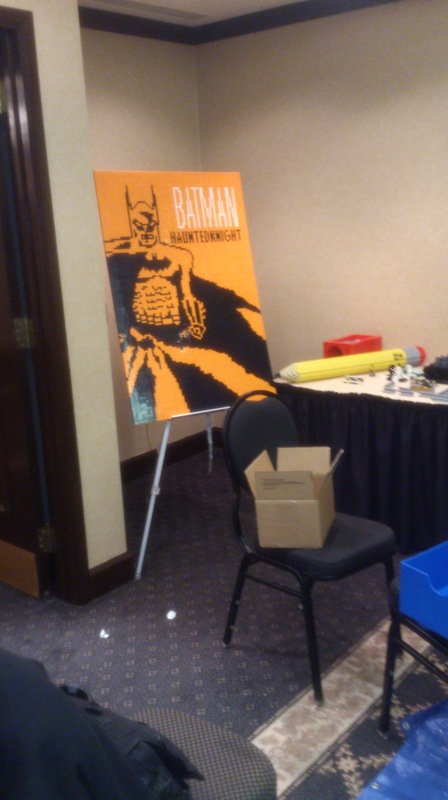 Very cool Batman cover replica! And….my swag: Golden Age Flash T-Shirt for the Win! And always, books, books, books! I spent the remainder of Sunday afternoon and evening in Toronto proper with one of my oldest friends. We rewatched Zombieland and then watched This is the End for the first time. All in all, a wonderful trip. Ad Astra was a great con experience and I’ll definitely be back.